We strictly observe all Occupational Safety and Health Administration (OSHA) guidelines. To protect our patients and ourselves, our staff wear masks, gloves, goggles, as well as hospital scrub uniforms. Our sterilization process is monitored by Emory Medical Laboratories, which regularly checks the effectiveness of office sterilization procedures and ensures the patient’s protection from infectious disease. All instruments are cleaned, disinfected and routinely sterilized as recommended by the American Dental Association and the Centers for Disease Control. Whenever possible, disposable single use items are used to ensure your safety. 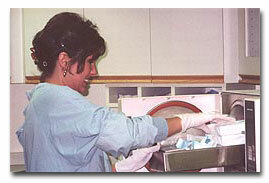 Hand pieces are sterilized with a state-of-the-art sterilization unit specifically designed for that purpose. All surfaces in the rooms are cleaned and disinfected after each patient. The advantages of automated washing systems over traditional manual cleaning are recognized by the CDC and independent research and testing organizations. If it’s not clean, it can’t be sterilized.